Treat yourself to pure, creamy bliss with AERO Milk Chocolate Minis. Made with 100% sustainable cocoa, each bite-sized mini melts in your mouth with the classic, real milk chocolate taste you love. Perfectly sharable with family and friends that also love to FEEL THE BUBBLES MELT™. For more MINIS, click here! 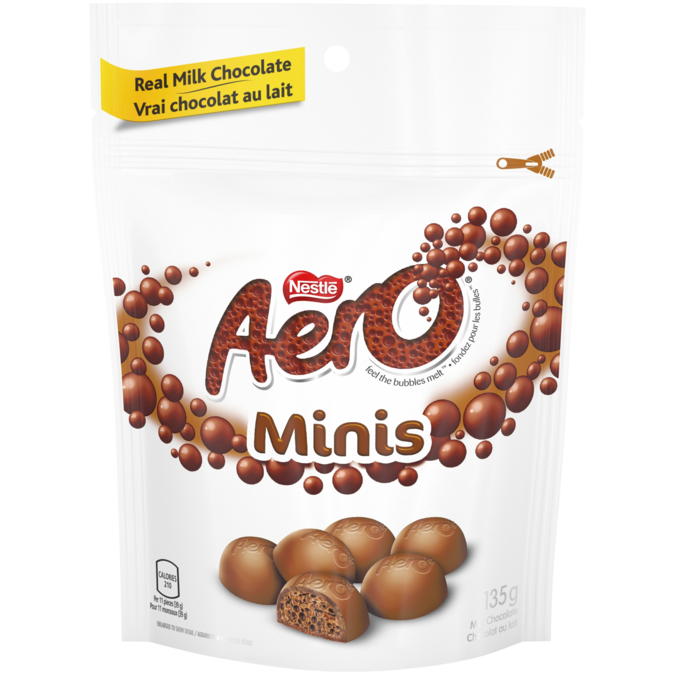 Bite-sized minis of classic AERO real milk chocolate, in a resealable pouch. Made with 100% Sustainably Sourced Cocoa certified by UTZ, as part of the NESTLÉ COCOA PLAN. We work with UTZ and farmers to improve the quality of their products and strengthen their communities. We proudly support Kids Help Phone! NESTLÉ Canada has raised more than $10.2 million in support of Kids Help Phone over the last 28 years. A fresh and fun idea for your Valentine's Day celebrations! Make your next mug of NESCAFÉ a mocha! Treat Halloween party guests to an eye-popping treat. Melted AERO Bubbles combined with MACKINTOSH pieces add a new twist to a classic favourite. Perfect for sharing any time.